The DJ-turned-priest is throwing "techno memorial services"
Forget Berghain, Japan has an actual techno temple in Fukui City. 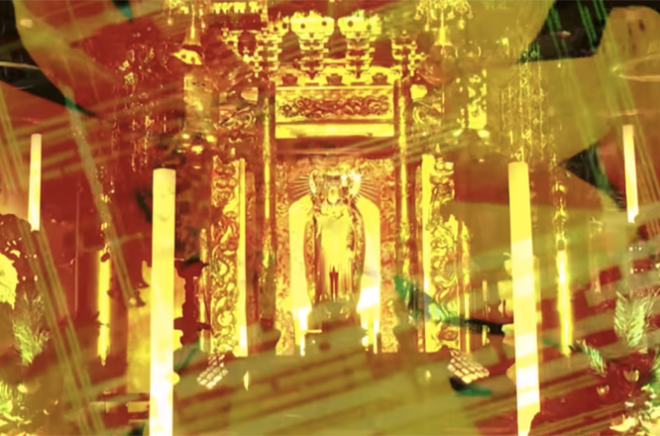 At the Shō-onji (照恩寺) temple, a 49-year-old DJ-turned-Buddhist-priest named Gyōsen Asakura has been throwing “techno memorial services” where he incorporates various electronic music styles along with psychedelic visuals into his services. Called the Show-On-G Memorial Service, the description says that he is trying to represent paradise with contemporary light. Asakura has held two such services before, which is where the video below comes from. He’s also currently raising funds to keep the project alive and to purchase better equipment. Although he has already well exceeded his goal, you can donate to the cause here. Asakura recently spoke to THUMP about his initiatives: "Originally, golden decorations in the temple are expressions of paradise light. However, the light of a traditional temple has not changed its form from 1000 years ago to use candlelight, even after electricity was invented. I felt doubtful about that, and then I thought about expressing paradise with the latest stage lighting such as 3D mapping. We also hope to revive the Japanese faith with these ceremonies." Watch a mesmerizing video from Asakura's service in October of 2016 below.